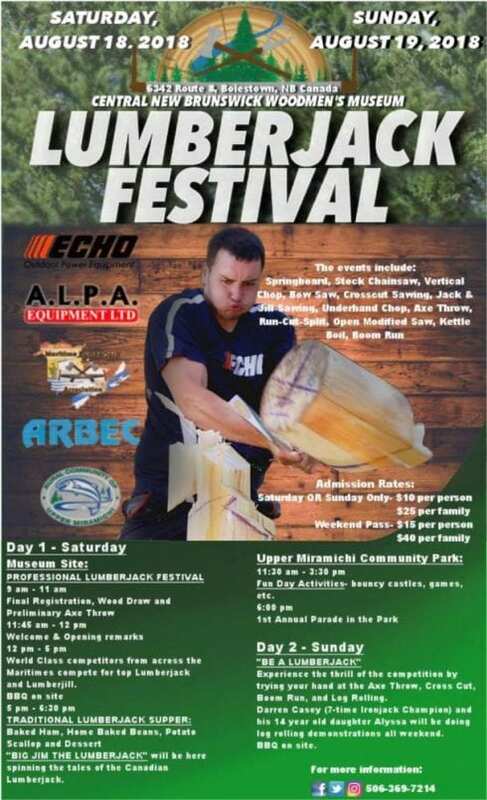 The Central New Brunswick Woodsmens Museum in Upper Miramichi (Boiestown) will be hosting a Woodsmen’s Museum Professional Lumberjack Competition 2018 beginning on Saturday August 18th, 2018 beginning at 12:00 pm noon at the Museum located at 6342 Route 8, Upper Miramichi (Boiestown), New Brunswick. As well, learn lumber jack skills from the champions at our “Be a Lumberjack” day! Try your hand at axe throwing, cross cutting, log rolling and maybe even dare the boom run!